This piece was a special request artwork. 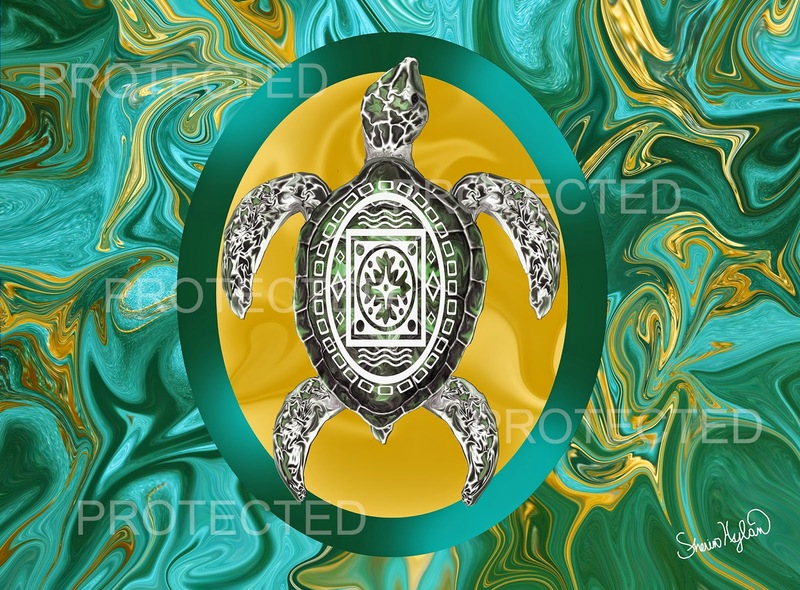 It is an Aztec Emblem Sea Turtle in a beautiful setting of vibrant teal blue green shades with gold accents. Turtles symbolize the worldly elements of both the earth and sea, and this guy has an ancient wisdom about him. This artwork is now available in both the Zazzle and Society6 stores on various products. I will be adding more types of products as time permits. If you have a special request or would like this on a blanket, metal print, or acrylic art block, please use the contact form to express your interest. Sherin A. Hylan is a digital artist who loves to create original wildlife and nature art pieces using a wide palette of vibrant colors. Her artwork is available for purchase as prints and on various products such as apparel, kitchen items, phone cases, home decor, and much more. These items are available through the links in the “Shop Artwork" section. Other items available for production are blankets, metal prints, and acrylic art blocks; if you are interested in a commissioned piece or purchasing any of these items, please use the contact form to express your interest. ©2014 Sherin A. Hylan. Awesome Inc. theme. Powered by Blogger.